The Stream DVD Review And Giveaway! Fine Print: I was given a copy of the movie for review and a winner will also get a copy. All opinions and statements below are my own. It’s summer 1981, and Ernest Terry (Jacob M. Williams) — like most boys his age — is obsessing over George Lucas’s Star Wars saga. In the woods outside Ernest’s neighborhood, capture-the-flag contests escalate into sprawling Jedi battles, with bright yellow Wiffle ball bats substituting for lightsabers. But when a bully snaps Ernest’s already-damaged “weapon” in half, Ernest and his friends accept a mission: Follow a nearby stream to the town mall, buy a new bat and return home before their parents realize they’re missing. The awkward preteens wrestle with small crushes, big imaginations and equivalent coming-of-age obstacles on a lazy summer afternoon. This film stars Rainn Wilson (“The Office”), Mario Lopez (“Saved By The Bell,” “Extra”), Kelly Rutherford (“Gossip Girl”) and Christopher Gorham (“Ugly Betty,” “Once Upon A Time”), the coming-of-age adventure is powered by a nostalgic top-40 soundtrack that will bring parents back to their childhood with songs from Billy Squier, The Go-Go’s, Joan Jett & the Blackhearts and, of course, John William’s iconic Star Warsscore. There are a few things about this movie that I found really fun! 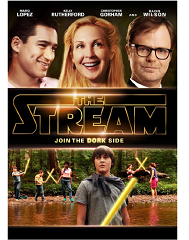 First, you’ll notice from the font on “The Stream” poster that this movie is VERY loyal to the main character’s love of Star Wars. Second, the tone of the film is super fun. It’s like a cross between “Stand By Me” (with full narration by Rainn Wilson and nods to the movie with mentions like “Lardasses”), “The Goonies” (with the kids on a fun and energetic adventure that brings them together) and “Stealing Home” (with the whole love of an older woman/younger man vibe). Adults will find the entire film and tone of the movie nostalgic and kids will want to be on the journey. I love this! Even better – and best of all!! – my third thing to tell you about is this: The Stream is a film that actually benefits the Boys & Girls Clubs of America, with a portion of the proceeds being donated to the organization to support their youth development programs. Nearly 200 children from BGCA, as well as additional teens from Philadelphia’s Big Picture Alliance and from Dreaming Tree’s Fresh Films Chicago program, worked behind the camera and/or in the editing bay during filming. You’ll see shots of this at the end of the film. To get everyone excited about this fun adventure, I am giving one lucky winner a copy of The Stream DVD! To enter this giveaway, complete any or all of the options listed below. Giveaway ends 10/10. Good luck! I think that would have to be the movie Stand By Me. I think I would love this movie. Reminds me of some others I’ve enjoyed like the Sandlot, My Girl and Now & Then–great movies for family get togethers. Ohhh, I would have to say it’s Charlie and the Chocolate Factory. Wizard of Oz makes me feel nostalgic. I would have to say Bambi. It reminds me times long ago. Sixteen Candles makes me nostalgic. Thank you! Always looking for kid friendly movies! Cinderella makes me nostalgic. When I was growing up that was my all time favorite movie. I am talking about the movie that had Ginger Rogers and Leslie Warren. Not the animated one. My girl, Wizard of Oz and Bridge to Terabithia all take me back. Bridge is a little newer, but gives me that nostalgic feeling of wandering the woods and creating a new world. The movie The Goonies makes me feel nostalgic.